Once again, the XTREME PSP Magazine is available to download. Our latest issue has been available on RSS for three days now, but now is public. 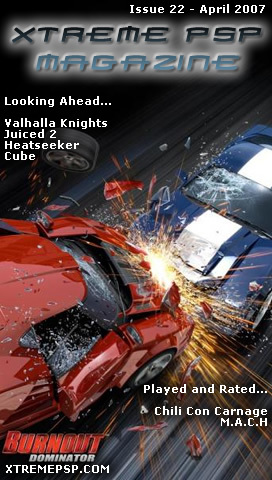 Issue 22 contains over 100 pages of content, including previews of Cube, Juiced 2, Heatseeker and more, plus reviews of Chili Con Carnage, Burnout Dominator and more. Also included are our usual monthly features such as news stories from last month, the second half of our PS3 competition, tips and cheats, emails from our readers and more. Thanks for reviewing Chili Con Carnage and 300: March To Glory on this issue’s PSP magazine. I was the one who requested it a month ago or (I can’t exactly remember but it’s in this site somewhere). Anyways, keep up the good work. This PSP magazine rocks.